Peace from the street up! 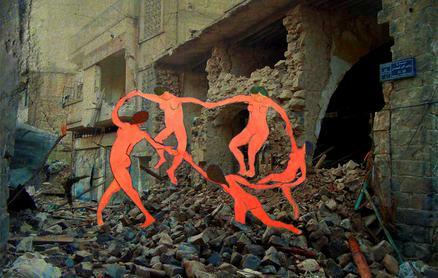 Three works from Tammam Azzam’s Bon Voyage and Syrian Museum series’ will be exhibited at Peace from the street up!, an exhibition under the #ART4PEACE programme, taking place at the Talking Peace Festival in London from 4-20 September 2015. Including work from more than 20 international urban and street artists such as Otto Schade, David Whittaker, Ganzeer, and War Boutique, the exhibition will focus on the theme Peace in our Cities which explores the new challenges that urbanisation poses to peace, from organised crime to civil unrest, and identifies possible solutions. The Talking Peace Festival is a unique arts and cultural platform organised by the peacebuilding charity International Alert. Designed in order to engage people in the most urgent issues of peace and conflict around the world, it is scheduled to celebrate the UN’s International Day of Peace on 21 September.